In June 2016, a salvage excavation was conducted east of the Bustan neighborhood in Hazor Ha-Gelilit (Permit No. A-7689; map ref. 251250/766300; Fig. 1) prior to the construction of this new residential neighborhood. 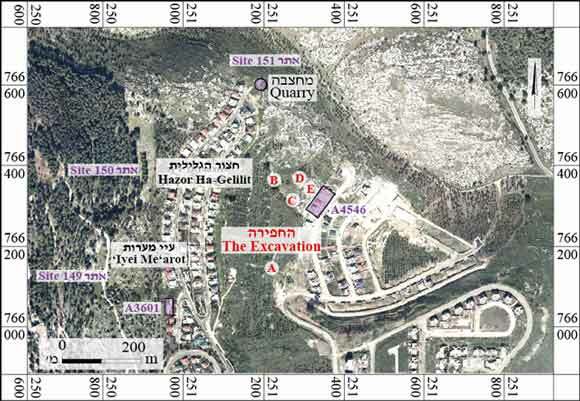 The excavation, undertaken on behalf of the Israel Antiquities Authority and underwritten by the Ministry of Construction and Housing, was directed by U. Berger and A. Kleiner, with the assistance of Y. Ya‘aqobi (administration), A. Peretz (photography), R. Mishayev and R. Liran (surveying and drafting), N. Marom (archaeozoology) and a team of laborers from Hazor Ha-Gelilit, Manda and Majd el-Krum. The site of ‘Iyei Meʻarot, on the lower part of an eastern slope, was first surveyed in the latter half of the nineteenth century (Conder and Kitchener 1881:197–199; Guérin 1987:252) and again in the late twentieth century, in a survey of synagogues, in which the remains of a synagogue and a Jewish settlement were identified (Ilan 1987:22), as well as in the Rosh Pinna Map survey (Stepansky 2012: Sites 149, 150, 151). The site was partially excavated in 2002 and 2005 (Hartal and Bron 2013; Smithline 2006), when several of the ancient settlement’s industrial and agricultural complexes were unearthed and documented. 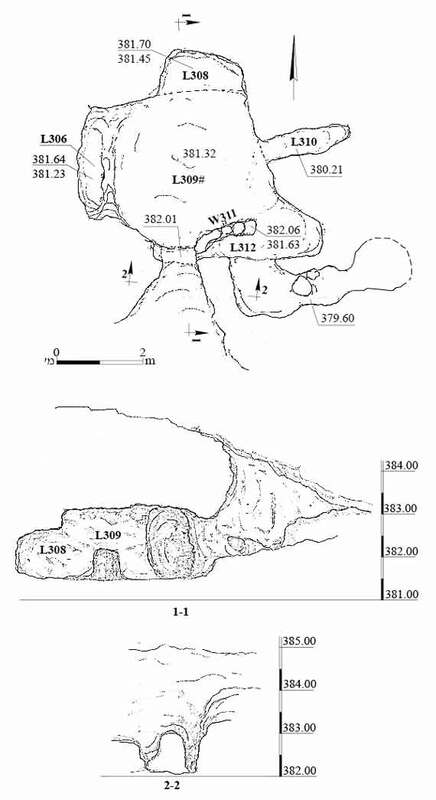 Five excavation areas were opened (A–E; Fig. 2) in the area between the previous excavation sites. The finds included a Byzantine burial cave, as well as installations and cupmarks belonging to the complex of winepresses and rock-hewn features exposed by Hartal and Bron (2013), which could not be dated. Also found were stone clearance heaps, field walls and an agricultural terrace—part of the traditional agricultural system of the Arab village of el-Mughâr (Mughar el-Kheit) until the late 1940s. A carefully built elliptical stone heap (6.5 × 8.5 m, height 0.7 m; Fig. 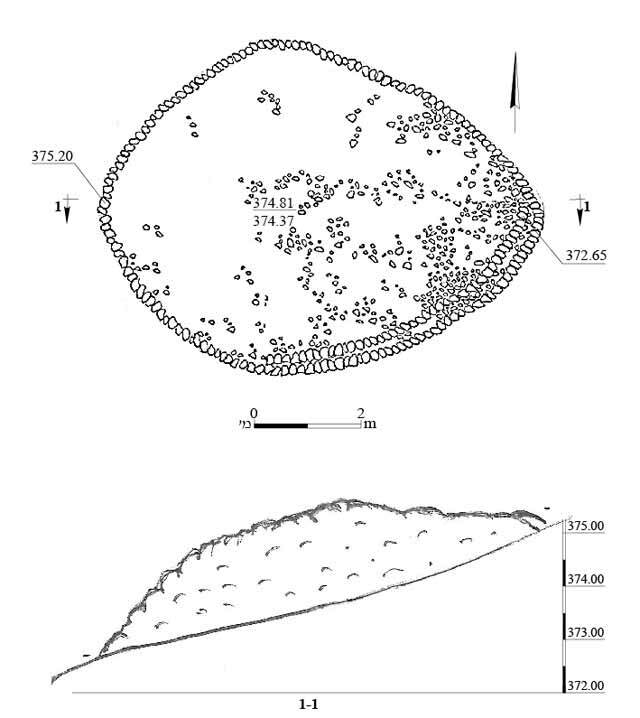 3) delineated by a stone wall identified by Stekelis (1948) as an ancient burial structure (tumulus). The excavation revealed that it was a stone heap made by local farmers when clearing the slope. The pottery from the heap—mostly worn body fragments—indicates that it dates from the Byzantine period at the very earliest. An agricultural terrace (5 × 11 m) surrounded by stone walls (Fig. 4) was excavated on the bank of the streambed that crossed the excavation area from east to west. Most of the walls were destroyed after years of neglect and lack of maintenance and care. The deposit inside the compound yielded a few worn potsherds from the Roman, Byzantine and Ottoman periods; no finds were discovered while excavating the walls. The farming terrace was obviously built to provide additional farmland in the rocky terrain of the site while limiting the natural flow area of the stream running through the site. Stratum III. 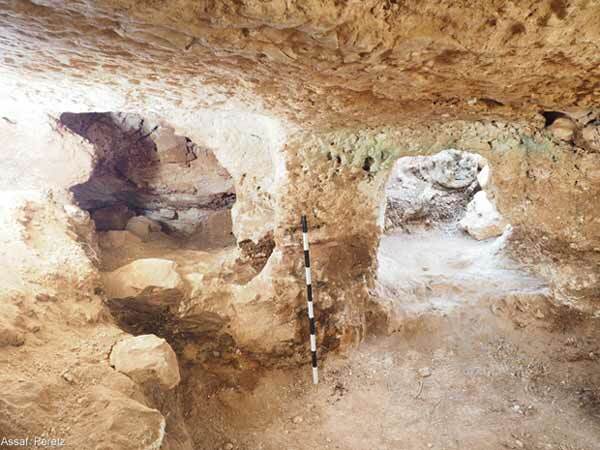 A stepped, rock-hewn entrance (1.3 m below the surface) led to a rectangular entrance (width 1 m, height 1.4 m), which was probably closed with a door or roll-stone; the stone was not found in the excavation and may have been robbed or removed centuries ago. The central chamber (L309; diam. c. 3.5 m) was quarried into the soft limestone bedrock. Arcosolia and bathtub-like burial troughs (L306, L308, L312) were hewn in its northern, western and southeastern walls; they were badly damaged but contained human skeletal remains. Numerous remains of human bones were also found in the deposits covering Floor 309. An elongated loculus (L310; 0.8 × 2.0 m, height 0.8 m; not excavated) was hewn in the eastern wall. A passage led from Arcosolium 312 another chamber and a narrow tunnel leading eastward; the chamber and tunnel were not excavated. The original passage entrance was destroyed and enlarged beyond its initial size, but it is unclear whether this resulted from a deliberate destruction or from natural weathering. Several stone slabs (average dimensions 0.1 × 0.4 × 0.4 m) were scattered around the central chamber of the cave. Some of them seem to have been used for covering the deceased in the burial troughs and for blocking the loculus, but they were removed, possibly when the burial cave was plundered. A few potsherds were recovered; these were mostly small, poorly preserved ribbed body fragments that could not be dated. In the absence of datable finds and based entirely on its style, the quarrying and use of the cave is estimated to have been in the Late Roman or Byzantine period (Lederman and Aviam 1997; Porath 1997; Stern 1997; Zingboym 2001; Porath 2007). Stratum II. 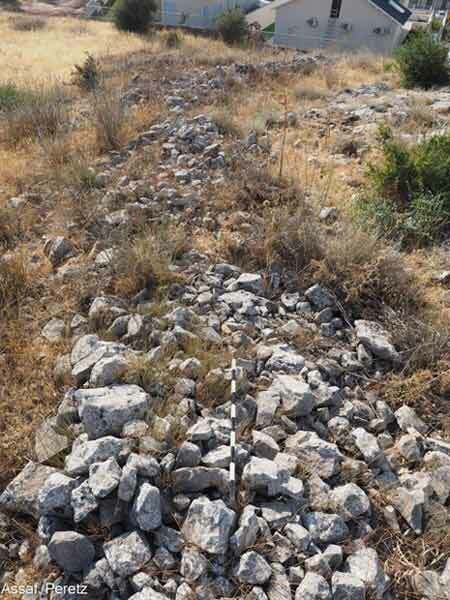 A roughly built stone wall (W311), partially built with stone slabs in secondary use, similar to those mentioned above, was founded on Stratum III. The lower half of a Mamluk-period jar (Fig. 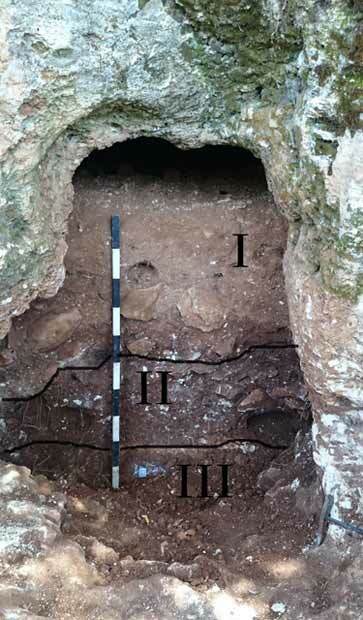 8) was found at the entrance to the cave and sealed under a relatively large rock (0.45 × 0.50 × 0.60 m). 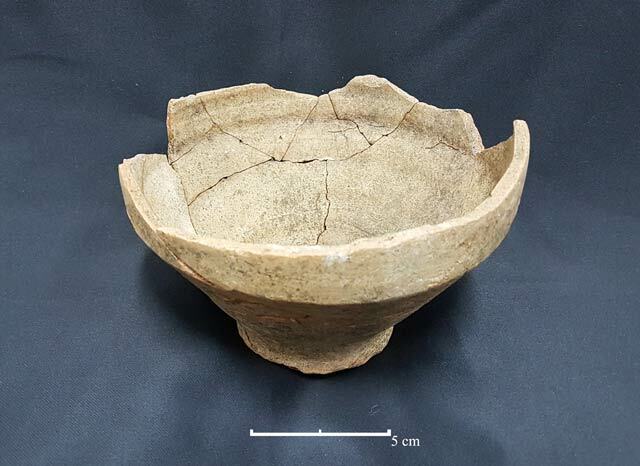 After the jar fragments were restored and examined, it became apparent that it was broken when left at the entrance to the cave to be used as a deep bowl. Burial caves are used now, as they were in the past, as shelters for shepherds and their sheep (Guérin 1987:252; Cinamon 2014). The improvised bowl may have been placed at the entrance as a drinking bowl for a sheepdog. Stratum I. An alluvium deposit washed in from the surface when the entrance was breached after the cave went out of use. Animal bones probably accumulated in the burial cave after it fell into disuse. The assemblage was identified using the comparative collection of the archaeozoological laboratory of the University of Haifa as reference, and the bones were measured (N=21; Table 1; Driesch 1976). Most of the bones belonged to two canine species: a large dog or a wolf (Canis lupus subsp. ), and a fox. The assemblage also included a few bones of gazelle, goat, donkey, and tortoise. Three bones—a donkey humerus, a dog humerus and a fox femur—bear clear gnawing marks. The bones contain no signs of weathering from exposure to the sun and the elements. This is evidence of primary or secondary deposition of carcasses, and not of bones deposited with the sediment that washed into the cave. The taphonomic finds (dental markings) therefore suggest that the bones accumulated in the cave due to activity of canine predators; nevertheless, the canine species (wolf or fox) cannot be identified. The last animal to make its den in the cave was a female porcupine. An elliptical compound (10 × 20 m, height 0.3 m; Fig. 9) delineated by a long field wall (length c. 100 m; Fig. 10) was excavated. It is unclear what the compound was used for; it was either an animal pen or an enclosed agricultural plot. The pottery from this area were meager, consisting of very worn potsherds, mostly from the Byzantine period, which were insufficient to indicate the period of the wall’s construction or use. 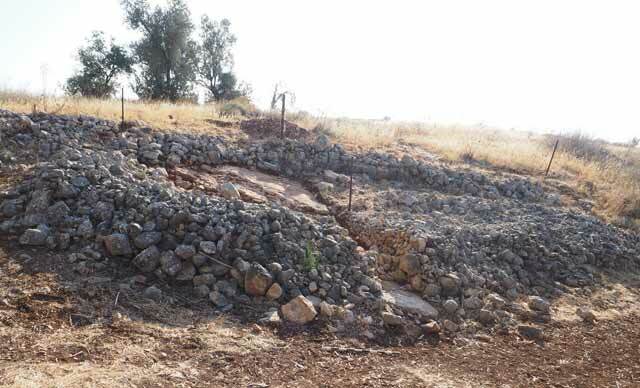 It resembles in its construction method and rather good state of preservation other field walls at the site, which date from the late Ottoman period and the time of the British Mandate, and thus seems to belong to this group of walls. On a limestone bedrock surfaces slightly west of the 2005 excavation area (Hartal and Bron 2013), was a cluster of six cupmarks and a rock-hewn basin (1.5 × 2.5 m, depth 1 m), which was probably used to store rain water and runoff along the slope. Aerial photographs taken toward the end of the British Mandate period (Royal Air Force 1946) show the area covered with field walls, agricultural terraces, stone-clearance heaps and an extensive system of agricultural enclosures; only little of this has survived to this day, more than 70 years after they were photographed. The transformation of the area into a residential neighborhood will erase any remains of the agricultural landscape that once existed here. The burial cave was sealed, covered, and will be preserved beneath the roads of the future neighborhood, despite the destructive nature of development work. Cinamon G. 2014. Horbat ‘Ammudim (Southwest). HA-ESI 126. Driesch von den A. 1976. A Guide to a Measurement of Animal Bones from Archaeological Sites. Cambridge, MA. Guérin V. 1987. A Georgaphic, Historic and Archaeological Description of the Land of Israel 7: The Galilee (B) (transl. from the French 1880 edition by H. Ben-Amram). Jerusalem (Hebrew). Hartal M. and Bron H. 2013. ‘Iyei Me’arot. HA-ESI 125. Ilan Z. 1987. Synagogues in the Galilee and the Golan. Ariel 52 (Hebrew). Porath L. 1997. Quarry and Burial Caves at H. Kenes (Karmiel). ‘Atiqot 33:81–88 (Hebrew; English summary, p. 15*). Porath Y. 2007. Burials from the Roman and Byzantine Periods at Caesarea. ‘Atiqot 55:45–56 (Hebrew; English summary, pp. 56–57). Smithline H. 2006. ‘Iyei Me’arot. HA-ESI 118. Stekelis M. 1948. 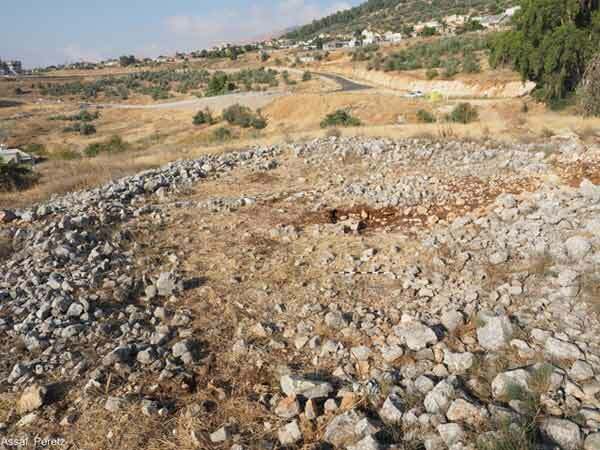 A Bronze-Age Tumulus in Eastern Palestine. BJPES 14/I–II:1–4 (Hebrew). Stern E. 1998. Burial Caves at Kisra. ‘Atiqot 33:103–135 (Hebrew; English summary, p. 17*). Zingboym O. 2001. Burial in the Jewish Settlement in the Golan in the Hellenistic, Roman and Byzantine Periods. M.A. Thesis. Bar Ilan University. Ramat Gan (Hebrew). 2. 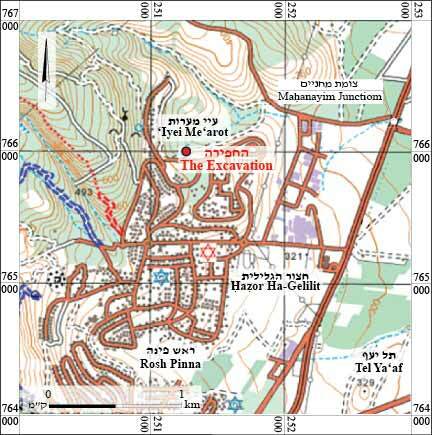 Excavation areas and locations of previous excavations. 4. Area B, looking north. 5. Area C, plan and sections. 6. Burial cave; on right, cave entrance opening, looking south. 7. Entrance to burial cave prior to its excavation and the three main strata in section, looking north. 8. Lower half of Mamluk-peirod jar. 9. Area D, looking south. 10. Section of long field wall, looking northwest.